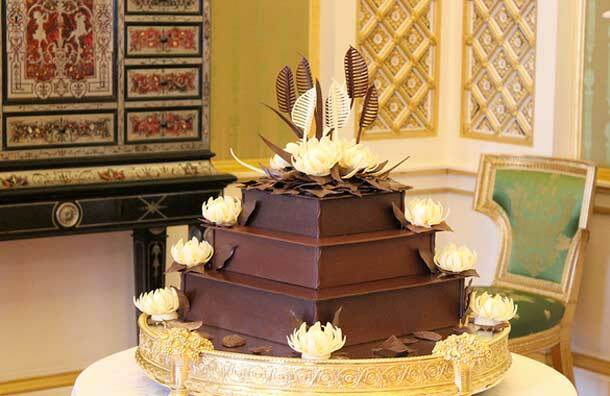 While everyone else was mooning over the giant, gorgeous, white behemoth of a cake created to mark the wedding of Prince William to Kate Middleton, this chocophile wanted to see a picture of his cake. Alas, I got busy, and forgot to look for one – until today. Three layers of a non-baked “cake,” made of crushed tea biscuits, and held together by chocolate, heavy cream, and a little honey, and then enrobed in – you guessed it – more chocolate. 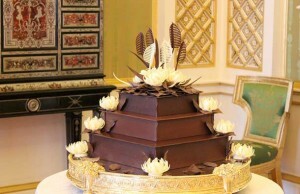 The whole, perfectly masculine, modern cake is then garnished with even more chocolate – milk and white chocolate feathers, and white chocolate water lilies. Inspired to make your own? Check out the recipe we posted in a recent round-up.